The New Year Issue of the XTREME PSP Magazine is now available to download. Issue 19, the first of many issues in 2007 is jam packed with over 90 pages of previews, reviews, tips and cheats, and other PSP related articles. In this issue you will find previews of Gran Turismo Mobile, Final Fantasy Tactics, Ford Street Racing and more. 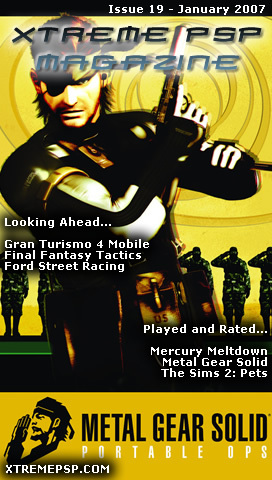 As for reviews, you will find one on Metal Gear Solid: Portable Ops, The Sims 2: Pets and Mercury Meltdown. All the usual conent is also included in the magazine from Tips and Cheats to the Mail Bag and Homebrew reviews. As usual, post your comments and any feedback using the comment feature or use the contact form to send us an email. FAQs and other help related questions are also welcome, but please refer to the FAQ Page before emails us to save you some time. Finally! Another great issue of Xtreme PSP! XTREME PSP Mag roks! no one else releases this frequently!